I had some more fun inking this week. Kevin Eastman, Steve Lavigne and I are collaborating on a Shellback Artworks-exclusive color print for the "Free Comic Book Day" weekend event at Steve's store in Wells, Maine. 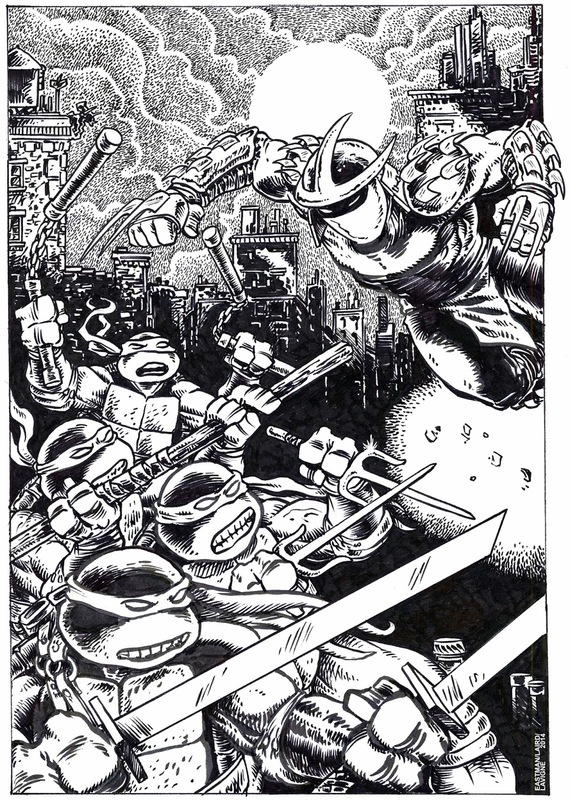 … looser than that great drawing he did for the IDW 30th anniversary comic book cover, but still replete with the signature Eastman elements of bold poses and interesting use of positive and negative spaces. To make it easier for me to ink, I used Photoshop to remove the nifty blue shading Kevin had done, leaving just the linework. … and the final inks, after cleaning up all the stray blue areas using Photoshop. And now I've seen it! Steve just sent me his cool color rendition of the piece, and here it is! This looks amazing!!!! I can't wait to see the colors that Steve adds too. Great change on Mikey's 'chucks. Looks awesome!! Can't wait to get one signed & framed! What size was/is it? Awesome! So fun to look inside a collaborative process like this. So interesting to see you and Kevin collaborating together again. I always felt like Kevin’s artwork was always real heavy, blocky, sort of gritty. At least over the years it’s become that way. Sometimes it’s hard to figure out because his foregrounds and backgrounds tend to be all the same line width. Your art has more refined lines and much more attention to details. It’s like one of you draws with a thick heavy pen and the other uses a thinner pen. You guys are so different, but when you come together it really makes the Turtles shine in a way that no other artist can. 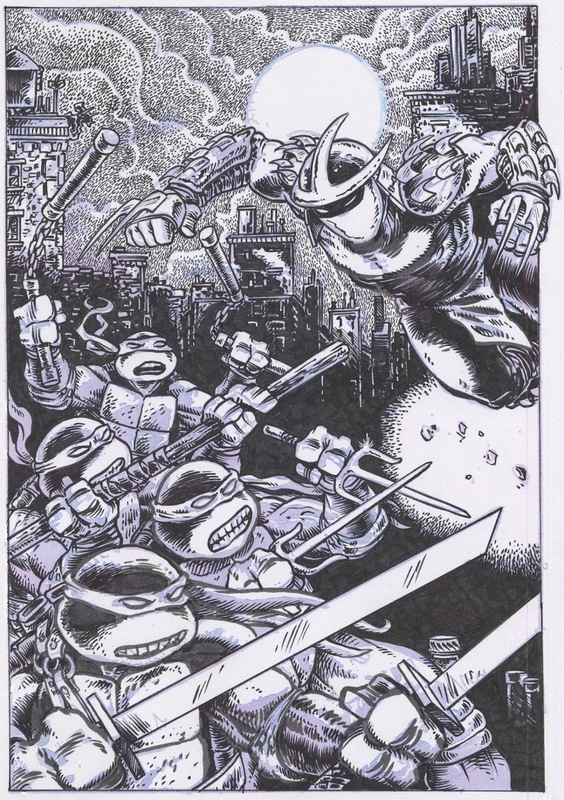 I know you at least once described eric tailbots way of inking like painting with ink but I always thought that beautiful of your inking work, too, peter.I really love all the detail and veriety of lines and ornaments you are bringing to a pencilled piece. I have to agree with the commentor above I really like the change you brought to the nuchuku of michelangelo.. I wondered if you went back to using brushes and rapidographs again by now.I remember you commenting here that a few weeks ago when getting to ink the piece for an archie reprint I think you felt more secure or comfortable by using pens for inking...has that changed already with the recent work you had to do? -->> GODAMN .. i love his, Pete .. so damned classy and classic !! !! Holy Hippo Spit! That's turtley awesome! 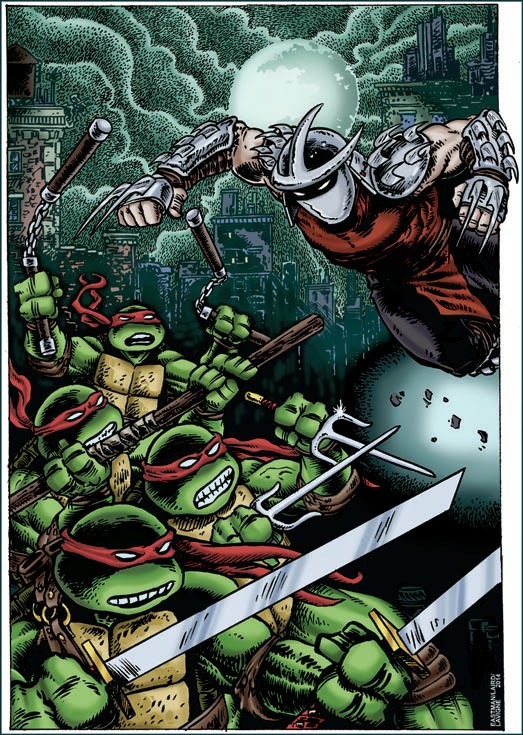 Am I the only one who feels like it's been forever since we've seen Shredder like this? He looks amazing. I really hope I can get this when I head over to Shellback. Really neat. 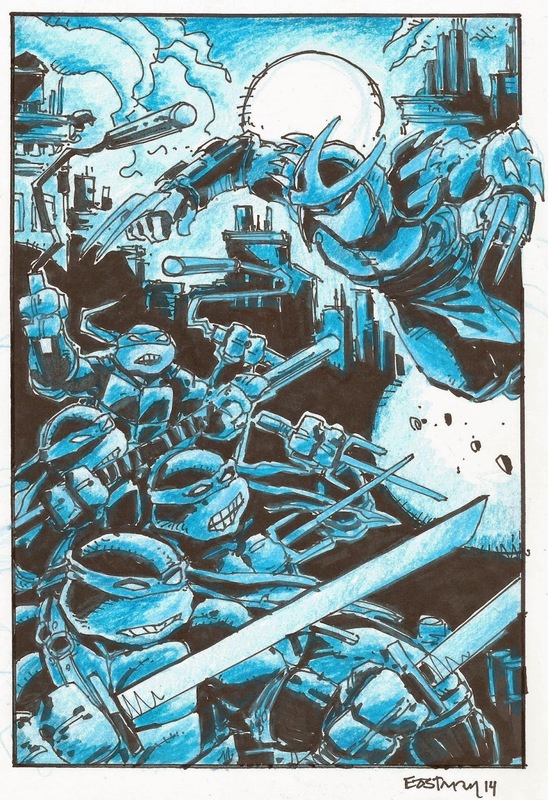 Very cool to see some of the modern work from Kevin and then what it looks like after it's been through the "Lairderizer" and come out on the other side as classic Pete & Kevin TMNT artwork. Really cool stuff overall. You guys are still the reason I wake up each day and strive to improve my art. Amazing thanks for sharing all these pieces over the years. Is there any way to get the new " Freezes over issue" issue or this print without being privileged to live in Maine? Anyway, New Hampshire Public Radio featured the signing in their segment on Free Comic Book Day! Pretty fun. Good morning Mr Laird. I just wanted to say thank you again for signing my items (and everyone elses) on Saturday & Sunday! It was great to see you guys all together again! I also wanted to thank you for staying so late yesterday, it was really great of all of you to go the extra mile. It did not go unnoticed, and was greatly appreciated! Also the print is awesome, I can't wait to get it framed and on the wall. Hey Peter! I just discovered your blog! 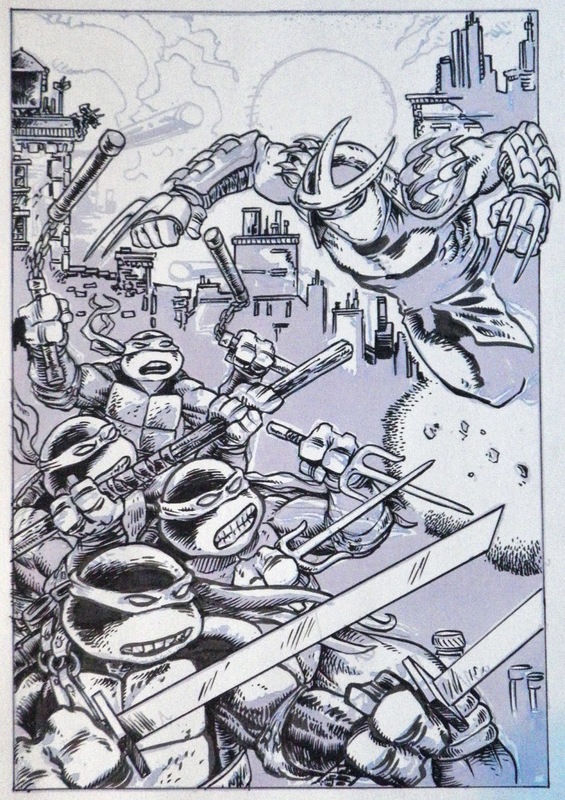 Been going down memory lane and reading the original and true TMNT comic books. This picture really brings me back! Glad that you're blogging! Will be following. Keep it up sir! Betting is not difficult and full of fun.